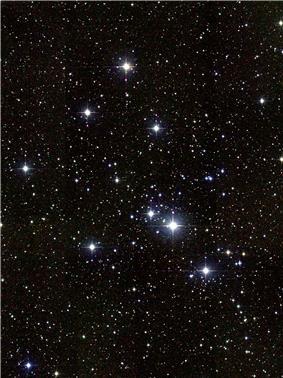 Messier 41 (also known as M41 or NGC 2287) is an open cluster in the Canis Major constellation. It was discovered by Giovanni Batista Hodierna before 1654 and was perhaps known to Aristotle about 325 BC. M41 lies about four degrees almost exactly south of Sirius, and forms a triangle with it and Nu2 Canis Majoris—all three can be seen in the same field in binoculars. The cluster itself covers an area around the size of the full moon. It contains about 100 stars including several red giants, the brightest being a spectral type K3 giant of apparent magnitude 6.3 near the cluster's center, and a number of white dwarfs. The cluster is estimated to be moving away from us at 23.3 km/s. The diameter of the cluster is between 25 and 26 light years. It is estimated to be 190 million years old, and cluster properties and dynamics suggest a total life expectancy of 500 million years for this cluster, before it will have disintegrated. Many visual observers speak of seeing curved lines of stars in M41. Although they seem inconspicuous on photographs, the curves stand out strongly in my 10-inch [reflecting telescope], and the bright red star near the center of the cluster is prominent. ^ a b c d e f "SIMBAD Astronomical Database". Results for Messier 41. Retrieved 2006-12-21. ^ a b "Messier Object 41". ^ a b Stoyan, Ronald (2008). Atlas of the Messier Objects: Highlights of the Deep Sky. Cambridge University Press. p. 171. ^ Kambic, Bojan (2009). Viewing the Constellations with Binoculars: 250+ Wonderful Sky Objects to See and Explore. New York, New York: Springer. p. 230. ^ Houston, Walter Scott (2005). Deep-Sky Wonders.